Our staff are trained to meet the needs of all our visitors.If you have any further questions about Access at the Museum, call 020 8983 5200. Our classrooms and audio visual displays are equipped with an induction loop sound enhancement system. An induction loop is available from the Information Desk. To use the loop, you will need to switch your hearing aid to the ‘T’ position. There are many interactives to touch and play with throughout the Museum such as dressing up clothes, rocking horses, Lego and a dolls’ house. The Museum also runs free activities for families every day, including arts and crafts, and storytelling. Assistance dogs are welcome. Water is available on request. There are lots of hands-on activities for visitors to engage with at the Museum including the Sensory Pod, a multi-sensory space in the Creativity Gallery. 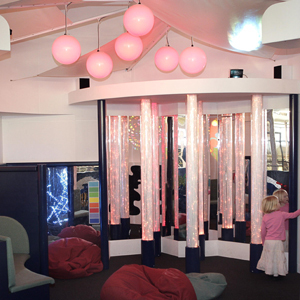 A range of resources and activities are available to visitors with special educational needs. For more information, visit SEN.
One Thursday each term is set aside as a Quiet Day, for groups with special educational needs only. This summer term it is Thursday 18 June. All ages of children and young people are welcome to these popular and inclusive days, when the Museum is generally quieter and students have full access to the galleries and interactive displays. Find out more about Museum quiet days. The Museum is wheelchair accessible and wheelchairs are available from the Information Desk. Seating is available throughout. Accessible toilets (including one fitted with a Radar lock) are located at the front and rear of the Museum, on the Lower Ground Floor. The rear lift can be accessed via the car park at the back of the Museum by prior arrangement. *Please note that our front lift will be undergoing refurbishment from Monday 23 April – Tuesday 8 May. Our back lift will remain in operation. We apologise for any inconvenience this work may cause. Free on-site parking can be arranged for visitors with specific access needs. The car park is accessed via Victoria Park Square, to the rear of the Museum. To book a space and for more detailed directions, call 020 8983 5200. The nearest pay and display bays can be found on Cambridge Heath Road. The Museum is not in the congestion charging zone. For visitors wishing to eat their own packed lunch, outdoor picnic tables are located in the Museum’s grounds. 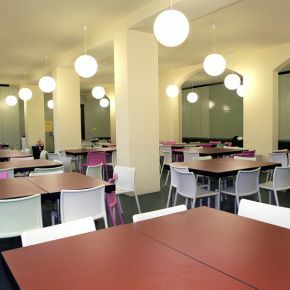 Additional facilities may be available at weekends and during school holidays in the Summerly Room on the Lower Ground Floor, but please check availability in advance of your visit. Highchairs are available from benugo café. Baby changing facilities are available in both the male and female toilets on the Lower Ground Floor and in the Quiet Room. A buggy park is located near the stairs in the Front Room Gallery. Items are left at the owner’s risk. The Museum’s quiet room is located on the Lower Ground Floor. The room has multiple uses: as a prayer room; a space for nursing mothers; or as a chill out space for families with children with autism. The room is equipped with an ensuite family-sized toilet, a bottle warmer, a baby changing table and comfortable seating. Free WiFi is available throughout the Museum.